22ltr Disposable Cannister – High Performance, fast drying formula. Wunda fast drying adhesive formulated specifically to bond Wunda EPS Overfloor Boards to concrete, screed & wooden floors with excellent high coverage of upto 150sqm*. Using a 22ltr disposable canister & re-useable spray lance will speed up laying time and make for an easier installation on larger jobs – with a 2 year shelf-life. 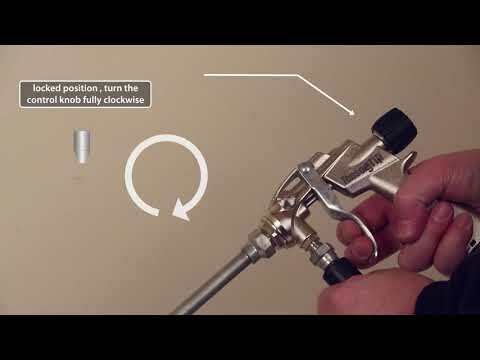 T07 - WUNDA BOARD SPRAY ADHESIVE 22 ltr Canister & Long wand spray gun user guide. *Up-to 150sqm coverage - single coat application. DO NOT TURN THE CANISTER VALVE OFF UNTIL THE CANISTER IS EMPTY AND YOU ARE READY TO REPLACE THE CANISTER WITH A NEW ONE (this is to prevent adhesive curing in the hose and gun). On initial use, or if canister has been standing for over 12 hrs, the hose and gun may require a purge. Pull the trigger and adjust flow by turning adjustment screw at the back of the gun (anticlockwise to open and clockwise to close). Dispense and discard adhesive until a consistent spray pattern is achieved. For optimum results store canister above 18° keep canister off cold concrete floors during use. Keeping the canister in the cardboard shipping box will provide storage for the hose and gun between uses. If adhesive is expelled wet or as a jet, canister is too cold – move to a warm environment and allow to thoroughly acclimatize before re-using. Wunda Overfloor panel adhesive is a web spray suitable for bonding EPS Overfloor boards directly onto suitably prepared concrete/screed and wooden floors. When connected, keep valve open and hose pressurised at all times – between uses this will prevent the adhesive from drying in the hose and gun. DO NOT close canister valve until ready to connect to a new pressurised canister. Use only in well ventilated areas. DO NOT thin or reactivate with solvents. DO NOT incinerate. DO NOT expose to extreme heat over 50° Keep away from sources of ignition. Release pressure in hose/gun before disconnecting hose from canister. Test for suitability before use. Avoid exposure to direct sunlight. Make sure that substrate is dry, clean, and free from dust, dirt, oil loose paint, wax, grease or any other substance that will prevent adhesion. Secure and or replace any loose floor boards, fill/level any imperfections in the substrate. We recommend shaking the canister well before use. 1, Attach and secure the hose onto the spray gun screw the larger nut to the gun thread (clockwise) and fully tighten with a spanner, check hose is securely attached. Check and tighten the spray tip this will give the correct spray distribution pattern. 2, Attach the opposite end of the hose onto the canister valve. Screw the smaller hose nut to the canister valve (clockwise) and fully tighten with a spanner. Check the hose is securely attached re-check and tighten all connections. 3, Turn the canister valve anti-clockwise until fully open. Check connections for leaks - if any occur, tighten connections. DO NOT TURN THE CANISTER VALVE OFF UNTIL THE CANISTER IS EMPTY AND YOU ARE READY TO REPLACE THE CANISTER WITH A NEW ONE (this is to prevent adhesive curing in the hose and gun). On initial use, or if canister has been standing for over 12 hrs, the hose and gun may require a purge. Pull the trigger and adjust flow by turning adjustment screw at the back of the gun (anticlockwise to open and clockwise to close). Dispense and discard adhesive until a consistent spray pattern is achieved. 4, Open the spray control knob on the back of the gun, open 2-3 full turns from shut and perform a test spray. The spray should form an even web pattern when held 10-20cm (4”-8”) away from the substrate. The easiest visual comparison that can be made to the correct spray pattern is that of a spiders web!. Opening the spray control knob will widen the spray pattern, closing the control knob will narrow the spray pattern. 5, Hold the gun at 90° angle to the surface, applying a uniform, even coat of adhesive to obtain 80%-100% coverage on the surface. If necessary, spray another coat in areas that appear to need more adhesive, some floor types may require a coat of adhesive to both the substrate and the underside of the Overfloor board. When applying to both surfaces apply one coat horizontally and the other coat vertically. 6, Allow adhesive to tack-off test for dryness using back of hand only; surface should be tacky but adhesive should not transfer to skin. Position the Overfloor board onto the adhesive, checking orientation before laying. Apply downward pressure onto the Overfloor board and smooth over ensuring a good bond between substrate and Overfloor board. Note; repositioning is not possible after contact has been made. 7, If the spray tip clogs, unscrew the spray tip from the gun lance and clean with a solvent such as lacquer thinner or acetone. DO NOT use a pin on the spray tip opening. 8, DO NOT turn off the valve on canister until ready to change canister (leaving the hose pressurised will prevent the adhesive from curing inside the hose) In between use leave the spray canister valve OPEN with hose/gun attached, close the spray control knob on the gun. DO NOT disconnect the hose/gun from the canister until ready to swap canister for a new full one. IMPORTANT: SAFETY GLASSES AND GLOVES MUST BE PUT ON BEFORE STARTING THE CHANGE OVER PROCESS We recommend shaking the new canister well before use. If you are not transferring the hose and gun to a new canister you will need to clean it to ensure it can be used again on future jobs. 1, Turn the canister valve clockwise until fully closed. Pull the trigger on the gun and hold for 10 seconds to expel residual pressure. 2, Unscrew the hose nut and disconnect the hose from the empty canister (move to next page for canister disposal). 3, Connect the hose and gun to the new canister, screw the hose nut to the canister (clockwise) with a spanner. Check the hose is securely attached. Check and tighten ALL connections turn the canister valve anti-clockwise until fully open and check all connections for any leaks – if any occur, tighten connections. Test spray a small amount of adhesive to check for pressure. IMPORTANT NOTE: THIS PROCESS SHOULD BE FOLLOWED THROUGH IMMEDIATELY AND ADHESIVE SHOULD BE DISPENSED FROM THE NEW CAN OR THE GUN AND HOSE WILL BLOCK AND BECOME UNUSABLE. 1, Lay the empty canister on its side with the valve pointing AWAY from the operator, and well away from sources of ignition. Open the canister valve (anti-clockwise) and release any residual pressure. Allow the canister to remain on its side whilst pressure is released, laying the canister on its side will ensure no residue of adhesive is expelled – just propellant. 2, Stand canister upright. Use a hammer and brass punch or other non-sparking instrument to puncture the friable disc. 3, As long as the user is able to accept responsibility for de-pressurising the canister, it can be disposed of as per your normal scrap metal disposal (subject to local waste restrictions). During transport, the recommended PPE, First Aid Kit and suitable Fire Extinguisher should be readily accessible in the vehicle. Keep vehicle well ventilated at all times whilst it contains spray contact adhesive. Secure canister during transportation.